The electrical system on this large steel boat is 24 volt. This permits power over long cable runs to the anchor windlass, hydraulic autopilot, and other systems. The supply is from new 24 volt alternators on each engine as well as the wind generator. The generator also charges the 24 volt batteries. A DC-DC converter provides 12 volt current as needed for instruments, lights, and other ship systems. This is a Bruce Roberts designed offshore sailboat heavily built with steel construction. Random hull thickness measurements taken in January 2019 averaged between 3/16" and 7/32" (about 5 MM) steel plating. This is his New York 65 model with the keel beam modification he specified for extra strength and support when lifted. The boat exterior has been protected with new primer, paint, and epoxy fairing where required. The deck has been repainted as well. The design features a raised saloon deck house and a large cockpit with a heavy stainless steel framework for a cockpit dodger and cover. This is a proven expedition vessel that is USCG certified for charter operation. The boat has been through the ice to the remote NW coast of Greenland, and is one of only a couple hundred vessels to ever have crossed the Northwest Passage of North America. The boat is currently hauled out for the winter in Alaska between charter seasons. Enter the boat through a large companionway with a Plexiglas hatch. The main salon is in a raised deckhouse permitting excellent views outside. To port is a large elevated L-shaped dining area with space to seat a large group. Forward of this are two large built-in refrigerator and freezer units. A very large and efficient freestanding diesel cabin heater is located here to warm the whole boat. Electric heaters are ready to be installed in more remote cabin areas as supplemental heating. A bookshelf is forward in the salon. To starboard is another settee seating area and a navigation station with a versatile custom chart table. From the main salon, moving aft is the master suite. This features a queen sized berth, ample stowage in drawers and lockers, and a private head compartment with a manual toilet and stall shower. A door to a workshop opens aft from the head compartment. This space provides access to the generator, tools and spares, the rudder and the massive hydraulic autopilot ram and systems. The entire hull is insulated with spray-in closed cell foam. The port lights and a few areas in the cabin need finish trim. Back in the salon a couple of steps lead to the forward cabins and galley. The very large galley is to port and features a three burner propane stove, double stainless steel sink, expansive counter space, and ample storage in drawers and cabinets with door locks for safety at sea. Opposite the galley to starboard is the first of three guest staterooms. This space features upper and lower berths, ample storage in shelving, an overhead hatch for light and ventilation, and a door for privacy. Forward to port is the second guest stateroom. This is configured in a similar manner with upper and lower single berths, shelving for storage, an overhead hatch and a door for privacy. Opposite this cabin to starboard is the guest head compartment with stall shower, sink and vanity, manual marine toilet, and stall shower. All the way forward is the third guest cabin. This features a large v-shaped double berth, ample storage in hanging locker, drawers, and shelving, an overhead hatch and a door for privacy. In the main salon, two spaces are available outboard as pilot berths. These are amidships and behind the settees in the main salon area. The abundance of single berthing is designed to be practical and comfortable for long distance offshore passage making. The anchor chain locker is wired with heavy cable to permit the installation of a second 24 volt windlass. 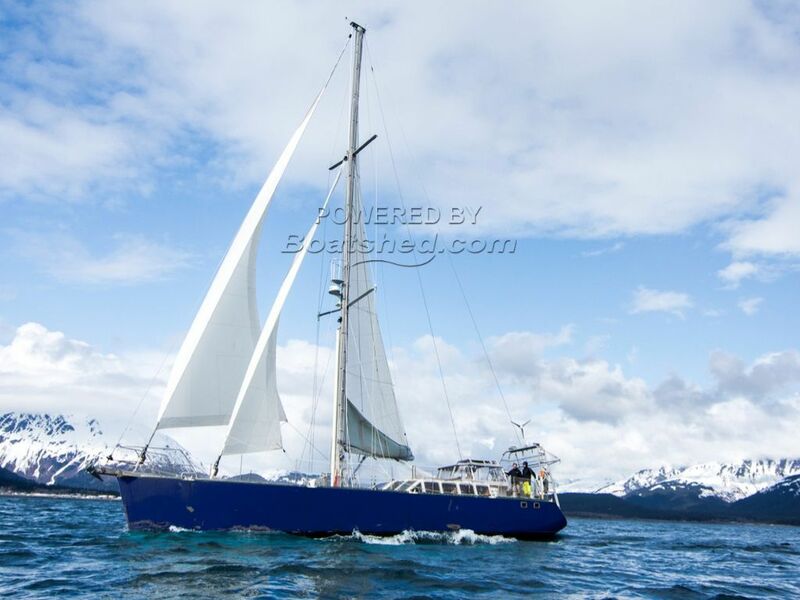 A true expedition charter sailing vessel, our 65’ New York Steel Cutter has been to the remote NW coast of Greenland and through the Northwest Passage of North America in the ice. Owned and maintained by offshore delivery and ship systems professionals and USCG certified for passenger for hire service. This boat is well found for living aboard in comfort and sailing anywhere in the world in safety with guests and crew. For serious buyers, the owners will deliver the boat to any port on the west coast of Alaska, Canada, or the continental USA for the cost of fuel, provisions, and port fees. This Bruce Roberts New York 65 Steel Cutter has been personally photographed and viewed by Brian Moratti of Boatshed Port Townsend. Click here for contact details.